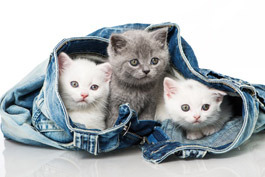 Ellerslie Vet Clinic is offering Kitten Kindy ®, an opportunity for young cats to learn to be sociable and where their owners can learn how to raise a well adjusted kitty! Our Kindy is open for kittens between 7 and 14 weeks (or the parents of up to 16 week old kittens without kitty being at class itself). Kitten Kindy® not only teaches handling and training (e.g. clicker training, practising ‘sit’ etc), but also to read our feline’s friends body language, to be aware of signs of illness in young and old cats, how to enrich our cat’s environment and behavioural problems like biting or inappropriate toileting. And the Kindy is FUN! For more information contact us on 09 281 3 481 or email us.